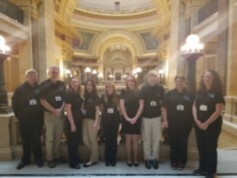 Kewaunee and Door County Legislative Days Youth Delegation Ashlee Siegmund, Morgan Rabas, Kayla Bosman, Will Hewett, Adilynn Schroeder, Kyle Gau, Krista Smidt, and Daria Ahrens spent several weeks preparing to speak about pertinent issues facing Kewaunee County at the 2017 Door/Kewaunee Legislative Day. Priorto the event, the teens worked with Jill Jorgensen, Kewaunee County 4-H Youth Development Educator, and 4-H volunteers Debbie Olson and Laura Siegmund to prepare for the visits. During four training sessions, the teens had in depth discussions about the topics on legislative agenda, researched facts about each topic and legislator they were meeting, prepared speaking points, practiced delivering their message of change or need in the county, talked about basic Kewaunee/Door information, and prepared them to work in their teams. 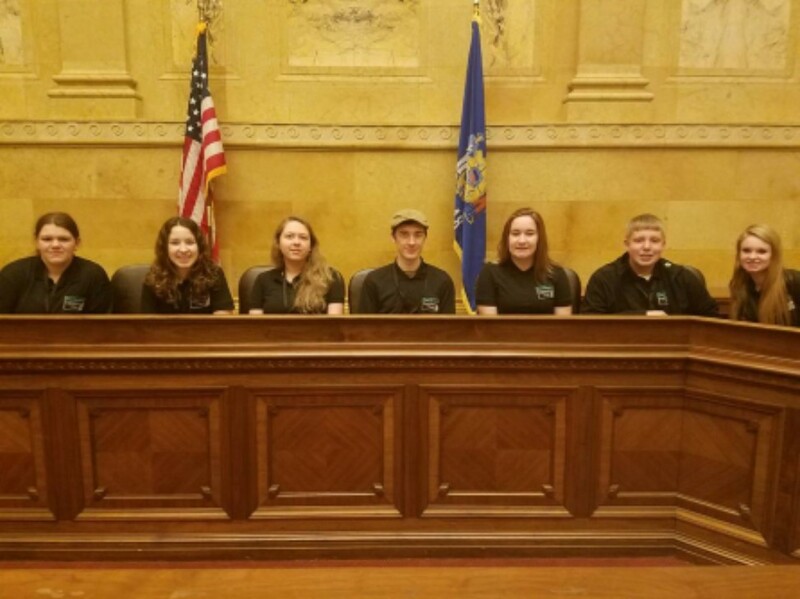 As the teens worked through the agenda topics, each of them commented on how they had personal stories and experiences with the topics and the need to discuss the topics with legislators. Pabich, Laura Siegmund, and Claire Thompson; and all of the community partners that support this day. Kewaunee County Fair Entries are Due June 1st! If you need to fill out a paper form or have any questions about junior fair entries contact Darlene Boeder, Fair Board Junior Exhibit coordinator, at (920)676-4580. One of the things that we do before the fair is help get the fairgrounds ready for all of our projects. We ask that you take some time to help clean and set-up in the building/barn where your projects/animals will be on display. Fair clean-up night in the exhibit building is Saturday, July 8th at 10am. For clean up in the exhibit building, we clean the cases, add new linings, set-up displays and get the building ready for project judging. Poultry and rabbit pen set-ups (at the rabbit and poultry barn) are on July 5th and July 9th. Check the calendar for updated times. Livestock and dairy stall and pen set-up is on July 15th at 6:30pm. Just a reminder to clubs, that you need to request the space that you need for youth animals projects by the following dates. Reservations need to be made as an entire club. Please make these requests are soon as possible to help fair coordinators figure out the best arrangements for all animals at the fair. Requests for pig, goat & sheep pens, dairy & beef stalls, chicken & rabbit pens must by done by July 5, 2017. Please call Darlene Boeder before that night at 676-4580. This is a reminder for any youth that plan on showing at the 2017 WI State Fair. The deadlines for submitting entries will be here before you know it. Please note: It is the family/exhibitor’s responsibility to be aware of all rules, regulations, and deadlines. The Kewaunee County UW-Extension office is not responsible for any changes in dates, times, and/or regulations. It is the exhibitor’s (and his/her family’s) responsibility to be aware of the deadlines and to read all entry information regarding the WI State Fair. Note! Junior Exhibitors can register for the Youth Center with their online entries (the Youth Center is listed under the “Department” options). Please note: printed entry forms cannot be scanned and emailed in place of online entries. Animal Shows Age Requirements: Participation in the Wisconsin State Fair Junior animal shows (beef, sheep, swine, dairy, goats, poultry and rabbits) is open to any boy or girl 12-19 years of age as of January 1st of the current year. 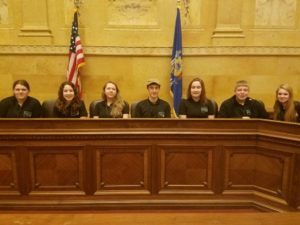 Youth must be an active/participating member in good standing of a bona fide, adult-supervised Wisconsin youth organization by March 1st of the current year. Junior exhibitors will submit all entry information and fees directly to State Fair either online or via the mail. 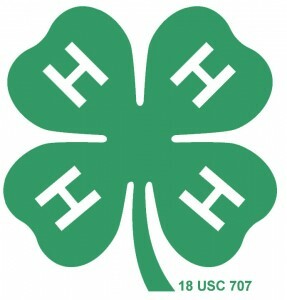 Local County Extension Office/4-H Educator will still be informed of State Fair youth programs but is not involved in the entry process. After the June 14th entry deadline, Wisconsin State Fair will verify participant eligibility with the respective approved youth organizations and local County Extension Educator or Fair Boards. Questions regarding entering the 2017 Wisconsin State Fair can be emailed to: entryoffice@wistatefair.com or call 414.266.7000. Want to know what’s going on in Project areas? Want to see photos of fun club activities? Visit our web site, where each club and Project has its own page! Want to submit club information, photos or fun activities?